A UNIQUE & EFFECTIVE PEEL EX-FOLIATING DAMAGED LAYERS OF THE SKIN. A PHYSICIAN DISPERSED SKIN CARE SYSTEM. TRANSFORMING YOUR SKIN AT A CELLULAR LEVEL. This peel is a unique peel as it a unique blend of acids: Salcylic acid, tricloroacetic acid (TCA) and Obagi Blue. It effectively exfoliates the uppermost damaged layers. By peeling the surface layers of the skin, you instantly have a glowing, younger looking skin. The best thing about it- very little or no downtime and can be used on all skin types. Blue Radiance Peel is also very effective at treating acne as it tackles acne at the origin. By starving the acne of its fuel, this peel removes comedones, deep cleanses pores and provides an anti-bacterial action. Your skin will be thoroughly cleansed before the active solution is applied. The peel solution gently exfoliates the top layer of the skin, smoothing the skins texture and boosting cell renewal. A cold compress is applied to activate the acid component. This is when you may feel a prickly sensation. Some clients do not feel anything. There will be no visible peeling or irritation, you can continue as normal. You see results after just 1 session, however we recommend 4 – 6 peels, with each peel spaced every 2 – 6 weeks to achieve optimal results. 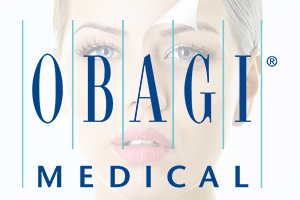 What is OBAGI Skin Peel? Obagi Blue Skin Peel is a leading deep rejuvenation treatment which helps eliminate blemishes, acne scars, wrinkles, uneven pigmentation and sun damage whilst increasing overall texture and tightness. Obagi Blue Skin Peel is an ideal treatment for anyone who wants to reduce the appearance of fine lines, wrinkles, severe pigmentation, adult acne and acne scarring to achieve visible, significant results. Prior to your treatment you will have a free consultation where all your questions are answered by our doctor and you are assessed for your suitability to proceed. TARGETING HYPER-PIGMENTATION TO DRAMATICALLY IMPROVE UNEVEN PHOTO-DAMAGED MOTTLED SKIN. A CHOICE OF 20% OR 30% GLYCONIC ACID. SMOOTHING OUT FINE LINES AND WRINKLES, IMPROVING THE APPEARANCE OF AGE SPOTS, PIGMENTATION AND DULLNESS. A LIGHT PEEL WHICH IS COMBINED WITH A FACIAL, THE IDEAL STARTER PEEL. The Pigment Balancing Peel is a brightening treatment targeting hyper-pigmentation to dramatically improve the uneven appearance of photo-damaged, mottled skin. The treatment combines brightening and anti-inflammatory agents with a peeling acid solution to accelerate cell renewal and diminish and diffuse hyper-pigmentation. 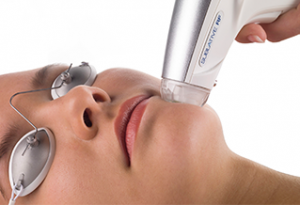 The Micro-Peel treatment has a choice of 20% and 30% Glyconic acid. Smoothing out fine lines and wrinkles, improving the appearance of age spots, pigmentation and dullness. A great peel for someone who does not want to dramatically peel but still want fantastic results. The Gel peel is a light peel which is combined with a facial to give you an instant glow with brighter healthier skin. An ideal treatment for anybody starting out with a peel. 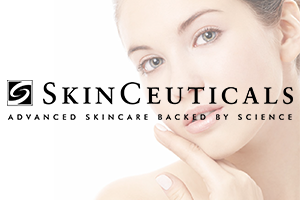 A MEDICAL GRADE SKIN TREATMENT THAT ENCOURAGES ANTI-AGEING AND STIMULATES SKIN CELL TURNOVER. WHAT IS SO UNIQUE ? What exactly is a Glycolic Peel? 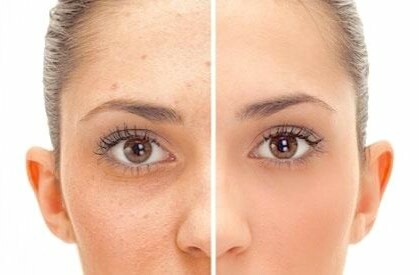 A glycolic acid peel treatment is a specific technique for skin renewal which removes the damaged layer of surface skin cells and reveals fresh healthy skin beneath whilst stimulating cell rebuilding and restructuring of deeper skin layers. Glycolic Acid is an AHA, or alpha-hydroxyacid which is a group of naturally occurring substances often called ‘fruit acids’ because they are found naturally in various fruits. In fact, Glycolic acid is found in sugar cane juice. Dermatologists have long praised the positive results of AHA treatments due to their benefits in improving skin appearance and texture. Is a Glycolic Peel suitable for my skin? It takes usually 4-6 treatments at three to four week intervals to achieve the desired effects. Most patients can undergo glycolic peels without any side effects.The treated skin is virtually normal in appearance. The fact that the patient underwent a peel is usually undetectable to others. Patients may experience mild sloughing, peeling, redness is temporary and normal. The procedure is fast and convenient, taking only about fifteen minutes. And with virtually no recovery time, you can be back to your normal routine the same day. There is no significant pain or discomfort. Dermaroller is a medical roller with hundreds of micro-skin needles arranged around it. As the Dermaroller is passed across the skin it causes small micro punctures in the skin surface that stimulates the skin to regenerate and repair itself naturally and safely, creating smoother, brighter, healthier, younger-looking skin. What areas can I have Dermaroller? If you suffer from acne scars, hyper pigmentation or aged skin then Dermaroller could be for you. 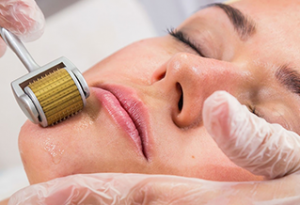 Stereotypically your face is the main platform for dermaroller. Also referred to as mechanical ex-foliation is a method of facial rejuvenation. Simply Pristine A complete medical aesthetic solution, Pristine treats a range of common skin conditions – including ageing, sun exposure, acne, scars tissue and stretch marks. Improves the overall quality and appearance of your skin. What are the advantages of Pristine™ Vs crystal-based systems? The Pristine™ has overcome previous shortcomings of crystal-based systems, making it the most wanted microdermabrasion system worldwide. The Pristine™ diamond tips are 100%hypoallergenic and there is never a possibility of ingestion or inhalation of loose crystals. Pristine™ allows you to treat sensitive areas more deeply, without fear of over-abrading tissue or over exposure to crystal irritants. The multiple options of treatment tips allow for a customisable treatment suited to the various patients you treat, their skin types and sensitivities. Finally, treatments can be performed 100% faster than traditional microdermabrasion achieving a full face treatment in less than 10 minutes! Swiss Care provide half and hour to a hour treatments which include a face mask, toning of the skin and a massage. Overall, microdermabrasion will reduce the appearance of wrinkles, remove acne scars, clear up blackheads, minimise the size of the pores, reduce sun damage, and even out the skin tone. 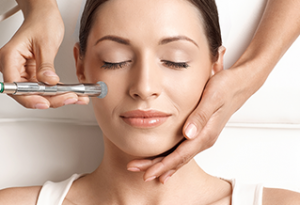 Microdermabrasion also helps to boost collagen production to provide firming and toning to the complexion. The world’s most extensive treatment selection. 13 diamond tips varying in size, shape & coarseness grades, customised for various skin types and symptoms. Sublime is an FDA–approved non–invasive, non–surgical procedure for restoring a youthful appearance. Sublime combines safe and effective levels of infrared light and bipolar radio frequency energies to remodel the dermal layer of the skin by stimulating new collagen growth. Sublime’s exclusive combination of energies provides ideal treatment outcomes with a very low risk of side effects and virtually no downtime. 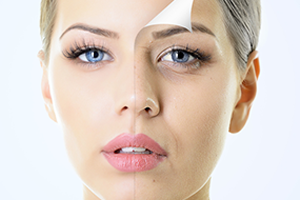 As with any cosmetic procedure, your degree of improvement will fade over time but the treatment can be repeated as often as is necessary to maintain your youthful look. A series of 6 treatments every 3 to 4 weeks is recommended for optimal results. The therapist will customise a skin care regimen to accelerate your results and help you maintain your improvements once you complete your series of treatments. Sublime is not a substitute for the traditional facelift but provides an outstanding alternative for patients who don’t want invasive surgery or aren’t quite ready for it. It is the fastest and most effective non–invasive treatment on the market for mild sagging skin, regardless of skin type or colour, and can quickly restore the facial texture and contour of your youth. The Sublative rejuvenation enables you to treat mild to moderate wrinkles, brown spots and textural irregularities such a scars and stretch marks. Radio frequency energy is applied to the skin the fact the treatment is delivered in dotted matrix aids to the healing process so post treatment new collagen and healthy skin cells are produced and your skin imperfections and discolorations are reduced. With the Sublime Collagen Creator treatment you can comfortably reverse the signs of ageing and achieve a more youthful appearance without any downtime! The combined light energy and bi-polar radio frequency stimulate collagen production so fine wrinkles are reduced, facial contours improved and skin quality is much smoother. You will also see that your face is sculptured and lifted and complexion more even. Sublative Rejuvenation utilises radio frequency energy to improve the skin, and it works through a unique mechanism. The radio frequency is delivered into the deep dermal layer of the skin, while at the same time delivering only minimal energy to the top epidermal layer of the skin. 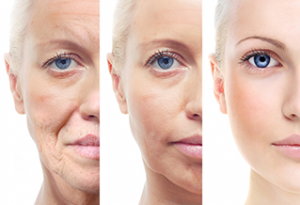 Sublative Rejuvenation is an FDA approved treatment suitable for nearly all patients. It will improve many different skin conditions. The treatment is ideal for rejuvenation of the face. It will tighten the skin, improve the fine lines and wrinkles that occur with aging, and reduce pores. Patients can decide to treat their entire face or may choose to have smaller area such as the skin around the eyes. 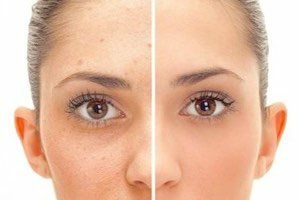 The Sublative Rejuvenation can also be used to treat acne scars . In addition, the neck, chest, and hands can also be treated and this will reduce the skin cre piness in these areas. As Sublative Rejuvenation is based on radio frequency energy and not on light, it is suitable for patients of all skin types and all skin colours . This makes the treatment extremely safe. A course of 3 to 4 session s every 4 to 6 weeks is required for optimal result. Sublative Rejuvenation utilises radio frequency energy to improve the skin, and it works through a unique mechanism. The radio frequency is delivered into the deep dermal layer of the skin, while at the same time delivering only minimal energy to the top epidermal layer of the skin. This method of energy delivery stimulates collagen formation in the deep dermal layer and is very protective to the skin’s surface. During the treatment, many patients feel a warm, prickly sensation as the radio frequency energy enters their skin. After treatment, a pink or red “sunburn” appearance is common. Numbing cream may be applied before the treatment to improve comfort. Most patients will be able to put on make – up and go back to work the day following the treatment. Treat moderate wrinkles, brown spots for smoother, softer younger looking skin. The Sublative rejuvenation enables you to treat mild to moderate wrinkles, brown spots and textural irregularities such a scars and stretch marks. Radio frequency energy is applied to the skin the fact the treatment is delivered in dotted matrix aids to the healing process so post treatment new collagen and healthy skin cells are produced and your skin imperfections and discolourations are reduced. Resurfacing the skin, helping with acne scars, damaging the upper dermis to reproduce new collagen. At the same time maximise your collagen production creating smoother, younger more vibrant skin. REMOVE ALL YOUR UNWANTED SKIN IMPERFECTIONS SAFELY, QUICKLY & PERMANENTLY. To remove the skin tag Swiss Care use the CryoPen™ this instrument emits a fine jet of nitrous oxide under high pressure, which allows the clinician to work with millimetre precision. This destroys the tissue by freezing the inter-cellular fluid, forming ice shards and crystals which rupture the membrane, thereby destroying the cell. That means there will be no collateral damage to healthy tissue. It’s so incredibly accurate and practical. What else can the cyropen treat? The cyropen can also Skin tags, Solar lentigo, Age spots, Milia, Warts, Cherry angioma, Viral verrucae. After the treatment it will take up to 2 weeks for the skin tag to drop off. The treatment only takes up to 30 seconds to actually do. 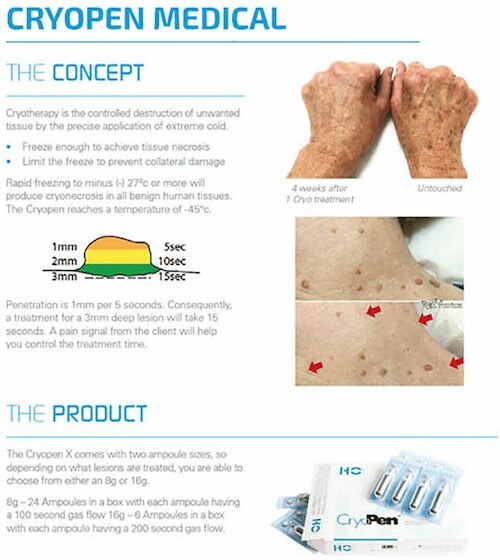 Due to the technology and the precision that the CryoPen achieves it will not affect surrounding healthy skin cells and tissues. The CryoPen™ emits a fine jet of Nitrous Oxide under high pressure which allows you to work with millimetre precision. This means there will be no collateral damage to healthy tissue. It’s so incredibly accurate and practical. You just load the device, choose the relevant applicator, point and freeze. We provide full salon training to demonstrate the CryoPen™ combined with a practical session where you will be able to use the CryoPen™. On completion of training you will receive full certification for insurance and marketing material. 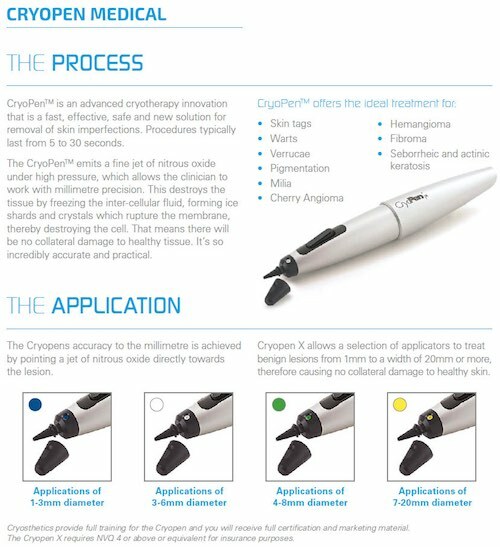 Insurers require that you are NVQ 3 qualified or equivalent in order to use the Cryopen M and medically qualified to use the Cryopen X. Cryopen™ offers the ideal treatments for milia, skin tags, pigmentation, warts, verrucae and cherry angiomas.